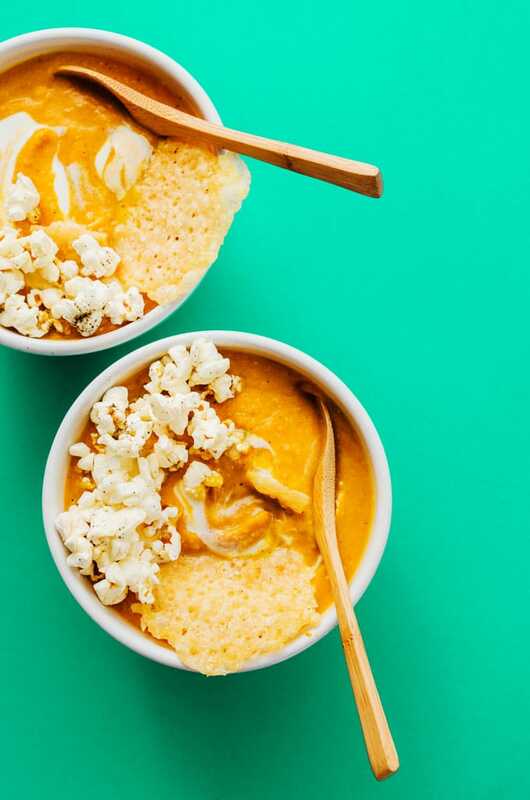 This easy pumpkin soup is topped with parmesan crisps and lightly salted popcorn, transforming simple soup into a fun and memorable dinner for holiday get-togethers. Every time I go home to America for a visit I come back to Europe with a suitcase full of food. Surprising, I know. But on my last flight back my suitcase was 2 lbs overweight…2 lbs of pureed pumpkin. The gate agent must have seen the desperation in my eyes (desperation to not toss out my cans of Libby’s pumpkin), as she helped me pick out the heaviest things to cram into my carry-on, bringing my delicious treasure trove of a suitcase to an even 50.0 lbs. So obviously I had to make sure that whatever I used my beloved cans of pumpkin on was not only foolproof, but really really good. And so, this easy pumpkin soup was born. 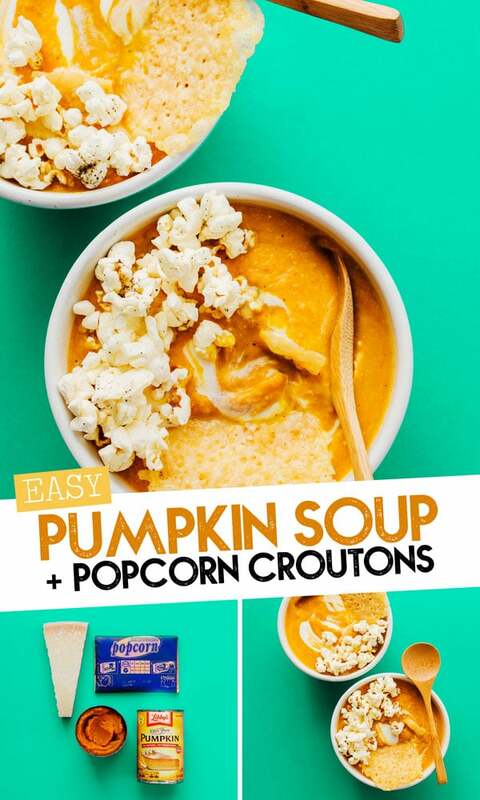 But you can probably tell by now that this isn’t just any pumpkin soup. This is popcorn soup. Crispy parmesan soup. Soup that knows no limits and doesn’t take no for an answer. Soup that makes dinner fun again. 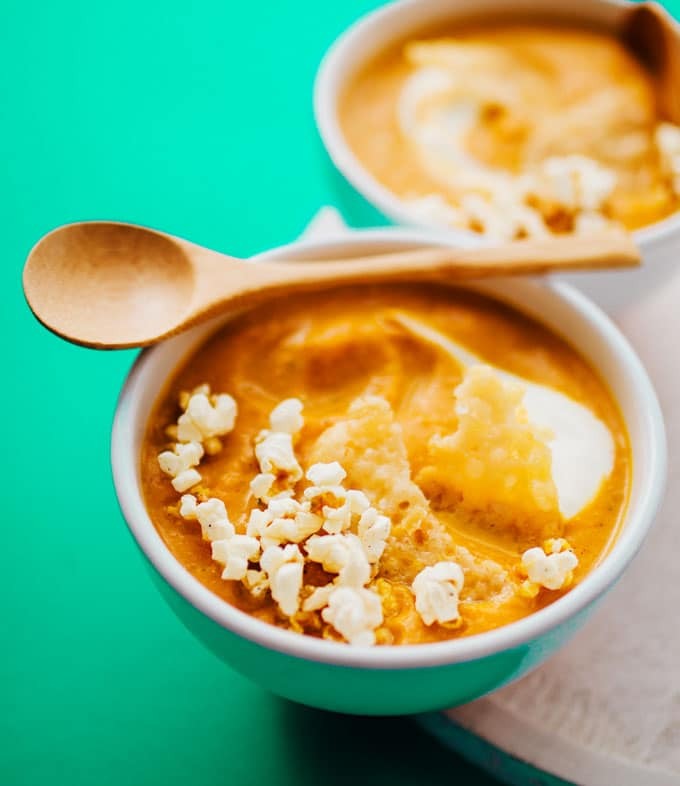 So in the name of throwing together ingredients that shouldn’t technically go together (see also Coffee Tofu, Beer Pancakes, Banana Curry), I bring to you this Easy Pumpkin Soup with Parmesan Popcorn Crunch! In other exciting news, it’s VPP day! That is, the day of ye ole’ Virtual Pumpkin Party, a day in which bloggers unite to flood the internet with delicious pumpkin recipes. 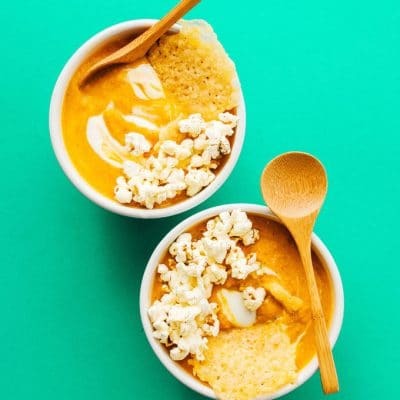 Be sure to check out the rest of the pumpkin recipes here! You can make this easy pumpkin soup with fresh pumpkins! You’ll need 2 sugar pumpkins. Chop the tops off the pumpkins, cut them in half lengthwise, and scoop out the seeds/stringy bits with a spoon. Rub a touch of olive oil on the inside of each then place face down on a baking sheet and roast for about 1 hour at 350 degrees F (175 C), until fork tender. Scoop out the flesh and blend until smooth, then use it in place of the canned pumpkin in this recipe. 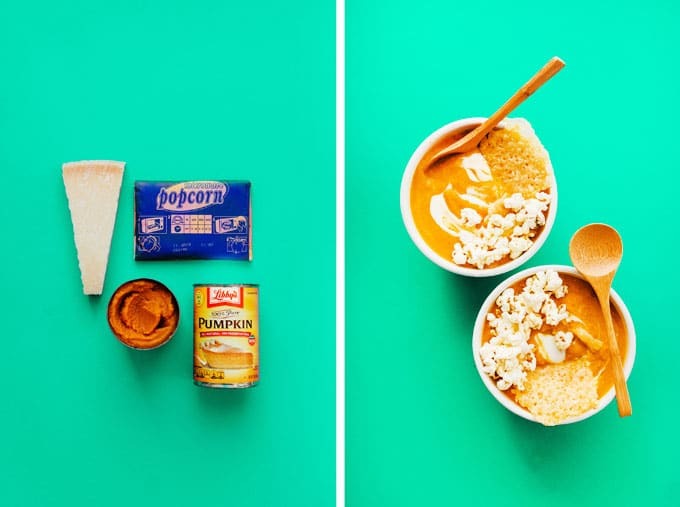 How do you make creamy pumpkin soup? When adding Greek yogurt to soup to make a healthy pumpkin soup, be sure to add it after you have removed the soup from the heat. When you add yogurt to hot soup, it can curdle, making for grainy, not-so-creamy soup. Pumpkin Soup: Heat oil in a large pot over medium heat. Add onion and garlic, sautéing until soft and fragrant, about 5 minutes. Add in the rest of the pumpkin soup ingredients except the yogurt. For a completely smooth soup, use a handheld blender to puree the mixture (or carefully puree in a countertop blender). Stir, cover, and let gently simmer. Parmesan Crisps: Preheat oven to 400 degrees F (204 C). Line a baking sheet with parchment paper and form heaping tablespoon-sized mounds of grated parmesan on the sheet. Flatten each mound slightly, then bake for 6 to 8 minutes, or until golden brown. Let cool on the baking sheet until crispy. Add Yogurt: Remove soup from heat and allow to cool for 10 minutes, until no longer piping hot. Stir in a spoonful of yogurt. If it curdles, allow soup to cool a bit more. When soup is cool enough, stir in all yogurt. Serve: Pop popcorn and lightly coat with EVOO, salt, and pepper. Spoon soup into bowls. Top with parmesan crisps and popcorn. Yum, this is soup is so fun and vibrant! Love that crispy, crunchy topping. Happy Pumpkin Day! !